We’ve all heard of this term ‘bounce rate’, haven’t we? But not many know what it exactly means. According to Google Analytics, bounce rate is defined as ‘the percentage of single-page visits on a website’. Okay, but why is it important? How does it matter? Picture this: You have a website. You want people to ‘convert’ by doing some activity- read about your services, buy something, sign-up for a newsletter or pretty much anything. But if visitors land on your page and bounce off without doing anything, there lies your problem. 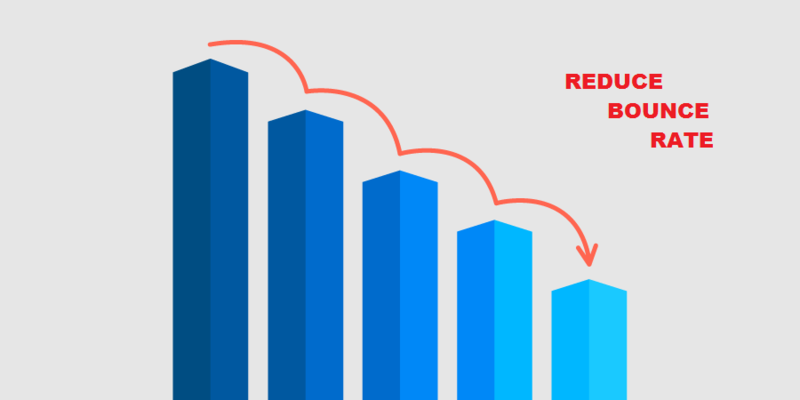 While bounce rates are a frustrating reality, it also indicates that your site needs to be fixed. Right from changing the design layout to modifying navigation options, there are quite a few things that can help reduce your bounce rate. Keyword optimization can make or break your marketing campaign. However getting any kind of visitors won’t do the trick. You need to be cognizant of who your visitors are and should provide content that caters to their interests. Say, you sell mobile phones. Your obvious goal should be to deliver on the promise of providing mobile phones by optimizing keywords related to mobiles. If you go about optimizing keywords for fixed-line phones, your visitors won’t be happy with the results and will bounce off the page. It’s a waste of SEO juice and your visitors’ time which will increase the bounce rate. If you have high bounce rate on your homepage or any specific landing page, it is high time you reconsidered your keyword strategy. Normally bounces occur when a visitor lands on a page and leaves without navigating to any other page. This happens when you’re acquiring the wrong kind of traffic. So how does one overcome this? First and foremost, don’t make the site complicated to your visitors. Site navigation should be a cakewalk. Keep it fairly direct and simple – go broad and wide if your site is huge. Present your content neatly with a liberal use of large fonts, bulleted lists, white space and good color contrast. Keep your copy- short and simple. Make use of images to help convey your point. Place your call-to-action in a prominent manner to lead your visitors towards building a conversion. There is no denying the fact that most people hate popups. According to a study by CrazyEgg, 70% of the people found irrelevant popups to be annoying. Some marketers even use aggressive language in their popups that make visitors to immediately leave the page. On the other hand, popups do work. They are one of the most effective ways to grow your mailing list. It remains debatable whether to use popups or to avoid them. What can be done is, making them subtle and less annoying. If you’re planning to build a site with a long-term strategy of generating organic traffic, it is best to avoid popups altogether or limit them considerably. We are living in the age of smartphones. More than 50% of the population is using internet through mobiles. If your page doesn’t look good or work properly on the mobile devices, you’re going to end up with high bounce rates. Considering the facts, it becomes imperative for any brand to invest time and money in making the website, a responsive one . In addition to that, mobile friendliness is a ranking factor in the latest Google update. No matter how useful your content may be, if the site isn’t mobile friendly, it’s not going to rank well in the search results. One of the important things that influence user experience is the page-load time. Slow loading websites kill any kind of engagement they might possibly have with the users. It is estimated that about 40% of web users leave pages that take more than 3 seconds to load. This is particularly true for mobile users. So what can be done to avoid page-load time becoming an Achilles’ heel? If you have a website that generates revenue through advertising, place the ads on the sides. Ads distract people! As discussed previously, avoid popups as much as possible. Self-loading multimedia content should be avoided at all costs. Fix all the broken links in your website. 404 errors can shoot up your bounce rate. Replace PHP with static HTML wherever possible. Though PHP is great for making an efficient site, calling information using PHP uses up server resource and should be replaced with HTML which can load faster. Most WordPress sites use one plugin or the other. They’re the biggest culprits for slowing down the website. Disable the plugins that are no longer in use. Maintaining a blog with fresh content yields the best ROI, by far. According to HubSpot, companies that update blogs with fresh content generate 126% more leads than those who don’t. However, it is essential to differentiate a gimmicky content from the right content. Any content that is produced should be done through the lens of strategic objectives. It should serve your business goals and should not be produced for the sake of it. In today’s media model, it has become fashionable to produce content that goes viral and generates likes and shares irrespective of their core objectives. By consistently providing good and right content, you become an intangible asset to your target audience. Now, why would anyone want to leave a site that provides them relevant and quality content! When all is said and done, ideally you should be tracking the bounce rate against your own historical data. In case you don’t have the resources to focus on decreasing your bounce rate, you can do a competitor analysis and determine if you need to reduce the bounce rate. As discussed earlier, you can compare your bounce rate against the industry averages. If you own a blog and your bounce rate is 80%, you may not have to worry much about it. However, this doesn’t mean that you can ignore it completely. Top blogs such as QuickSprout and Moz have bounce rates of not more than 50%. They create popular content and make people spend more time consuming it – something that every content marketer should aspire for. How else have you reduced bounce rates? Tell us in the comments section.